"Most beautiful in my judgement is the design of the bridge which follows, and very well suited to the site … in the middle of a city, … one of the greatest and most noble in Italy … and there is an enormous amount of trade … and the bridge came to be exactly … where the merchants gathered to do business." The Rialto was the commercial heart of Venice, the site of the only bridge over the Grand Canal. The old wooden bridge, which had been repeatedly repaired, was lined with shops and had a central section that could be raised to allow taller ships to pass. Andrea Palladio worked on several designs for the bridge with three arches but Antonio Da Ponte’s single-arch design was ultimately chosen instead and built between 1588 and 1590. In his Quattro libri dell’architettura, Palladio combined the design of the old wooden bridge, lined with shops, with details from Antique bridges such as rusticated piers, aediculed niches and slender columns. His plan was in effect to bring together twin bridges and maximise the potential for trade, with six rows of shops in three streets. In fact, access to the bridge at either end would have been impractical, with the openings in the porticoes too narrow to accommodate the numbers of people using the bridge, as well as traders bringing goods over it. 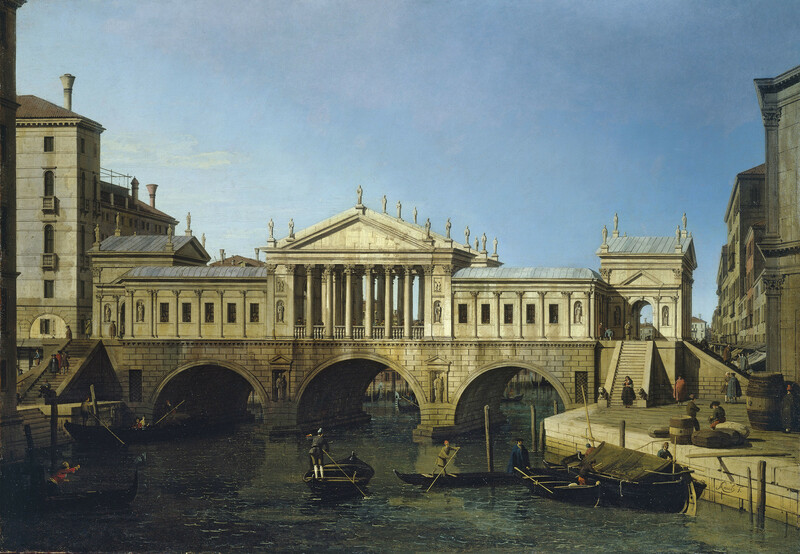 Canaletto’s view is from the north, with gentle sun casting interesting shadows, modulating the colours of the stone and transforming Palladio’s black and white woodcut design into a reality. Setting the bridge at a slight angle has made it more three-dimensional than the plan, revealing the four rows of columns in the central loggia and the depth of the arches below to show the massive width of Palladio’s design. The façade on the extreme right may be the Palazzo dei Camerlenghi and the building on the left perhaps the Fondaco dei Tedeschi; the other surrounding buildings, however, are fictional. Francesco Algarotti commissioned a second painting of the bridge at about the same date, flanked by two of Palladio’s palaces in Vicenza. Many other versions of the composition exist, the best known being in the Galleria Nazionale, Parma. A pendant, also in Parma, has an imaginary bridge based on that of Palladio and an invented circular building on the left. According to Algarotti, nature and art are united by combining the real and the imaginary. Canaletto’s skill lay in creating a view so deceptively realistic that even though this Palladian bridge was never built, many Venetians had asked Algarotti where this site in the city was that they had not yet seen. This painting is one of a series of thirteen overdoors by Canaletto, all with the same provenance. The views are imaginary, but they incorporate recognisable Venetian buildings and settings. Of the thirteen pictures, nine survive in the Royal Collection.